Researchers are perfecting a new technique that could speed construction of skyscrapers while also providing enough stiffness and strength to withstand earthquakes and forces from high winds. The project aims to develop a new kind of “core wall,” a vertical spine that runs through the center of skyscrapers, said Mark Bowman, director of Purdue University’s Robert L. and Terry L. Bowen Laboratory for Large-Scale Civil Engineering Research. A skyscraper’s core wall supports a portion of the building’s weight and enables the structure to withstand lateral forces from strong winds and earthquakes. A Purdue University release reports that Bowman and Michael Kreger, a professor of civil engineering, are leading the research, working with doctoral student Selvarajah Ramesh, undergraduate David Koppes, and engineers from Magnusson Klemencic Associates Inc., an international structural and civil engineering firm based in Seattle. The research has been funded by the Charles Pankow Foundation, a California-based, private-sector research foundation. Conventional core walls are made from reinforced concrete. A form is filled with concrete one floor at a time. Moving the form progressively upward is a time-consuming operation that cannot proceed until the concrete sets for each floor. The new system uses a sandwich of steel plates filled with concrete. The hollow structure is expected to be strong enough to stand for several floors, allowing construction to proceed on the rest of the frame before concrete has been poured and speeding construction dramatically, Bowman said. Researchers at the Bowen Lab have built a 3/8th-scale core wall using the construction technique. The specimen is about 30 feet tall. The release notes that steel rods under tension run from the top to the bottom of the specimen, exerting downward force and simulating the weight of forty stories. 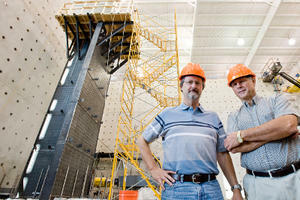 Researchers will use powerful hydraulic equipment to simulate the lateral forces exerted by earthquakes and high winds. Data from the research will be used to create design requirements for consultants and building guidelines for contractors. The researchers have been working on the project for three years. “This is a great example of how privately funded university research can translate into benefits for the building construction industry and society, while at the same time providing specialized training for emerging engineers,” said Robert Tener, executive director of the Pankow Foundation and a former civil engineering professor at Purdue.